Web Push Notification: Hello, Aaj ki post me hum aapko Push Notification kya hai? kaise work krta hai? ke bare me batane ja rahe hai to aap iski full details me read kijiye. Push Notification internet ke dawara provide hone wali ek services hai.Khas taur per web push notification ka use website and application me kiya jata hai.Pahle push Notification ke system ko most important website use krti thi, lekin present time me small se small website bhi push notification ka use krti hai. Agar aap bhi apna blog/website banaye huye hai or aap bhi push notification lagana chahte hai to please full read kre. 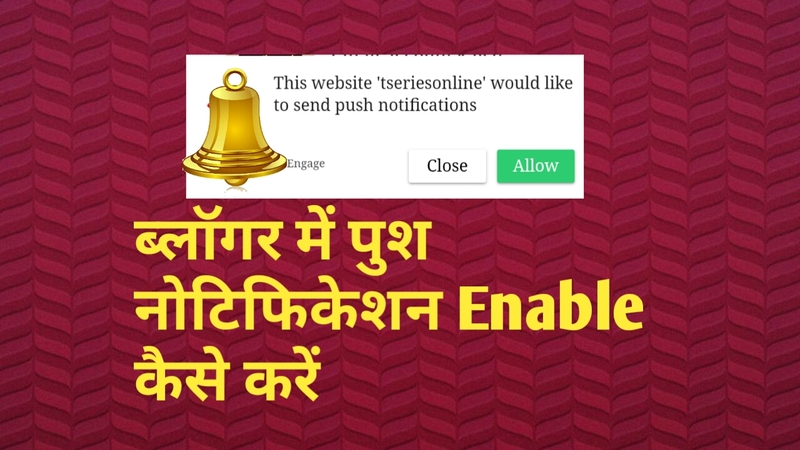 Web Push kya hai, vaise to user ko pta hota hai lekin jinko iske bare me jankari nahi hai unko bta de.Web Push Notification Blog ko visitor se jodne ka ek rasta hai. Web Push enabled blog me jab koi user new entry krta hai to uske samne ek popup open hota hai. Is popup ko hum Web Push Notification bolte hai. Web push blog me open hote hi visitor se allow ki permission mangta hai. Agar user web push notification ko "Allow" krta hai to subscriber me count ho jata hai. Iske baad jab aap apne blogger me koi bhi post publish krte hai to aap web push site me login krke is post ke url se 1click me sare subscriber ke pas notification send kar shakte hai. automatic post ka notification send Nahi Kiya ja Shakta hai. Web Push Notification blogger blog ke Liye bahut hi important hai. Web Push se blogger blog ki ranking increase krne me kafi madad/help milti hai. Agar aap bhi blogger me work krte hai to aap se request hai ki blogger me jarur se web push notification jarur lagaye. Push Notification marketing blog ke Liye bahut hi best hai. Blog me push notification account create krne ke liye aapko kuch step follow krne hoge.agar aap sari step successfully follows krte hai to blog me push notification send kar shakte hai. Step 1. Sabse Pehle aap "PushEngage" website per visit kijiye. 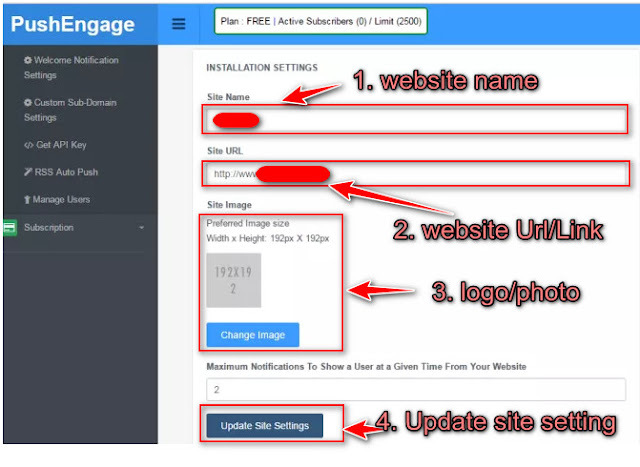 PushEngage website ka URL aapko niche Diya gya hai. Site per visit krne ke baad ek free account create kijiye. Free account se ek Baar me 2500 visitor ko push notification send kar shakte hai. In saari process krne ke baad aapko " CREATE FREE TRIAL " per click kre. Step 2. Iske free account successfully create krne ke baad new window open ho jayegi. Aapko isme kuch details fill krni padegi. Site Name: Isme aapko apni website ka name dalna hai. Site URL: Iske baad website ka Url/Link dalna hai. Site logo: Website ka logo/photo Upload kre. Aapko uper batai gayi sari details sahi se fill krne ke baad " Update Site Setting " Per click krke save kar lijiye. Step 3. Iske baad aapko sidebar me " Dashboard " Option show krega to aap us per click kre. Dashboard open hote hi "Start Using PushEngage in 3 Steps " ke niche 1.Install the PushEngage Scripts per click kre. Step 5. Guys is step ko aapko bahut hi carefully krna hoga. Ab aapko "Aysnc version" code ko copy krna hai or blog ke theme section me aaye and CTRL+F press krne per side me search bar dikhai dega. Search baar me aapko </head> type krna hai and iske baad yellow line me niche </head> highlight ho jayega.fir aapko </head> ke theek niche "Aysnc version" code ko paste krna hai.Iske baad aapko save kar dena hai. Step 6. Ab humko legacy code ko copy krna hai. Leagcy code copy krne ka baad blogger theme me aana hai and jo hamne "Aysnc code " paste kiya hai theek uske niche is code ko paste krke save kar de.iske baad website per visit krke dekhe. Hello, friends hum sath hi sath ye bhi dekh lete hai ki subscribers ke pas push notification kaise send krenge.Iske liye aapko apne Web Push notification services me login krna hai. Aapko web push Notification login hone ke baad Notification>>New Notification per click kre. Isme aapko ab apni Notification se related information fill krni padegi. Notification Title: Aapko apna title dena hai. Notification Url: aapke website post ka link/Page ka link dena hai. Friends, aaj ki post aapko kaafi pasand aayi hogi.hamne aapko kaafi simple language me samjane ki kosis ki agar aapko koi problem hai fir bhi to aap hame comment kar ke puch shakte ho.aaj ko hamare website ko subscribe kre more most popular post ke liye.